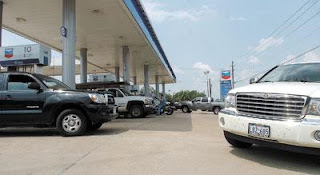 I thought that we would attempt to go to the Gulf this weekend, but after seeing lines of cars at gas stations, no gas at pumps, and the beginning of total chaos, I changed my mind. I guess Hurricane Rita traumatized me, but I didn't realize it until saw panic setting into the community. I guess I'm not the only one who was traumatized. I'll keep you all updated as the storm nears. 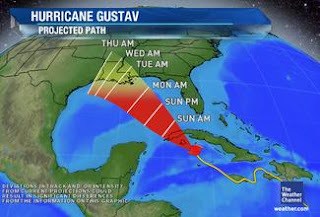 Well, I've been watching Gustav and I am thinking (more like hoping) we are in the clear. We are going to go ahead and meet mom and dad in Fulton for a fun filled weekend of fishing and relaxing. Can't wait! My next posting will be of that record breaking catch. Monday was the first day of class for all of us. Every year it gets a little harder to get the kids to cooperate for pictures. Oh well, they will get over it. I can't believe Dalton is an 8th grader and Callan a 5th grader. Where has the time gone??? Before I know it, they will be leaving for college. 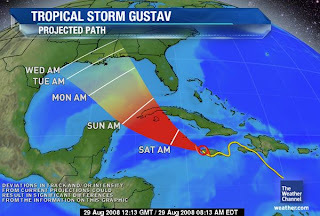 This weekend we are planning on meeting Mom and Dad at their in Fulton, but we are watching Hurricane Gustov. We are hoping it will just go away, but know that will never happen. I wanted to share with all of you a cool thing I discovered a few months back - Vinegar. Put vinegar in the rinse agent compartment of your dishwasher instead of Jet-Dry. Your dishes come out squeaky clean. Make your own fabric softener with vinegar, water, and hair conditioner. I use an old Downy softener bottle; mix equal parts vinegar and water with approximately 2 cups of cheap hair conditioner, and Voila! You have an awesome fabric softener that leaves you clothes smelling and feeling great without the residue that is left behind from store bought fabric softeners. Pour some straight vinegar in and on the sides of the toilet bowl, let sit for 15-20 minutes, scrub, and you are left with a clean toilet. Make you own Windex by filling a spray bottle with approximately 1 cup of vinegar, 1 teaspoon dish soap, and the rest of the bottle with water. I like to use this in the bathrooms because I can clean the mirrors and counters with the same non-toxic solution. I hope these suggestions help you all get a little closer to living cleaner, greener, more non-toxic lives. Callan introduced me to these videos, they are pretty funny! Another semester is on the horizon and I am so excited to see what it has in store for me. I can not mention SFA without also mentioning TCU, my graduate school, as well. Be sure to check out my countdown until graduation. I have recently become more conscientious about what cleaning products I use. I am not 100% green yet, but I am slowly moving that direction and hope to be one day. Once again I am amazed with Simple Green. I always have Simple Green lemon concentrate on hand and use it for various cleaning tasks around the house. I like to clean with it because it is a green product and smells good; it is right up there with vinegar in my book. Today I wanted to carpet clean Dalton's room before moving furniture back in, but was out of carpet cleaner for my steam cleaner. I did not want to go to the store so I googled "homemade carpet cleaner". One of the search results took me to a recipe for Simple Green carpet cleaner from concentrate. I decided "why not" and mixed up 3 ounces of Simple Green to one gallon of water (as the recipe stated). WOW!!! The mixture did such a wonderful job. I was crazy to think that I would have more time for postings this summer. I think this has been the busiest summer yet. This is going to be a longer than normal posting so I can somewhat catch you all up on our activities. Callan's Girl Scout troop used their cookie money to go on an overnight stay at the Houston Aquarium. We slept with the white tigers, well on the other side of thick glass from the white tigers. It was pretty amazing to wake up to playing (roaring) tigers at 4 o'clock in the morning. Thanks Houston Aquarium for a wonderful opportunity for the the girls. Callan wrestling the fierce tiger! One the two beautiful tigers we stayed with overnight. OK... I have run out of wind and need to get back to Dalton's bedroom redo. I'll post pictures of the final product.